Forecourt and industrial separators accumulate oil from spills and contaminated rain and cleaning water run-offs. Separators must be cleaned out regularly to prevent the discharge of unacceptable oily effluent to drains and to remove silt deposits. At sites susceptible to overloading the separator oil capacity, the danger of exceeding discharge consents can only be avoided by increasing clean-out routines. A practice that is time consuming and costly. Reduces the volume of oil retained. Reduces the risk of unacceptable oily effluent discharges and subsequent environmental damage. A unique, patented biological product from SSI Environmental that provides the above benefits. Bio Tubes absorb oil from the surface of the separator chamber. 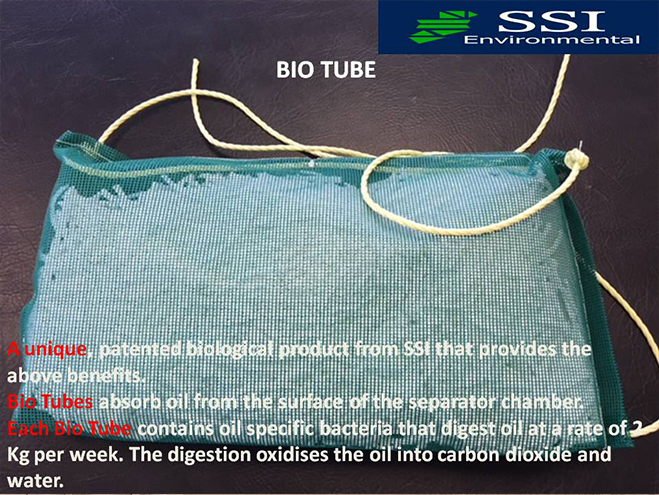 Each Bio Tube contains oil specific bacteria that digest oil at a rate of 2 Kg per week. The digestion oxidises the oil into carbon dioxide and water. Bio Tubes are simple to use and remain active for 6-8 months. They are entirely free of constituents likely to contaminate the discharge effluent. Independent tests have shown that the regular use of Bio Tubes results in a 33% reduction in waste oil and a 90%+ reduction in diesel, without the creation of harmful by-products. It was also demonstrated that oil discharges were reduced from 500mg/L to 19mg/L. OECD 301F and UK Environmental Agency studies.